The next original DC animated film is Superman/Batman: Public Enemies, due out on DVD on September 29. Based on a comic story by Jeph Loeb about Lex Luthor becoming President of the U.S. and declaring the heroes illegal, the movie features John C. McGinley as the voice of supervillain Metallo. The following interview text was provided by Warner Home Video, as was a previous interview with writer Stan Berkowitz. McGinley has crafted a well-rounded career in film and television, forcing audiences to instantly take note with his performances in Oliver Stone films like Platoon and Born on the Fourth of July. Instantly recognizable to television audiences for his portrayal of the sarcastic, abusive, hilarious Dr. Cox in 169 episodes of Scrubs, McGinley is also no stranger to animation, having spent significant hours in the sound booth recording for The Boondocks, Justice League (as The Atom), and in guest spots on King of the Hill, Kim Possible, and Robot Chicken. 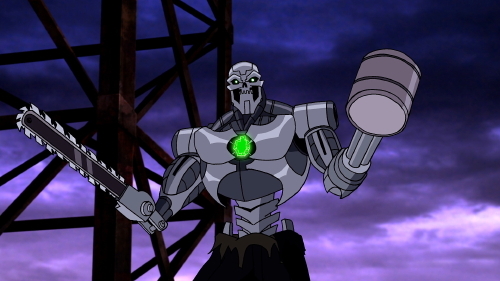 QUESTION: What were the joys and challenges of getting behind a microphone for a character like Metallo? JOHN C. MCGINLEY: It’s a real treat to collaborate with the creative folks once you get in the booth. Ten out of ten times, the people on the other side of the glass know the character better than you are ever going to — they have been working on this for months or years. All you can do is try to return serve because you are given all this wonderful, precise direction. I’ve found over the years it is really, really helpful to just integrate and go. It’s also a treat that the people on the other side of the glass are pretty much the top one percent of their industry, and I get to have this kind of creative input. You get on a lot of film sets and everybody is rolling the dice. Everybody is guessing their best. The people in that booth are not guessing, they know this stuff backwards. That to me is a huge asset. 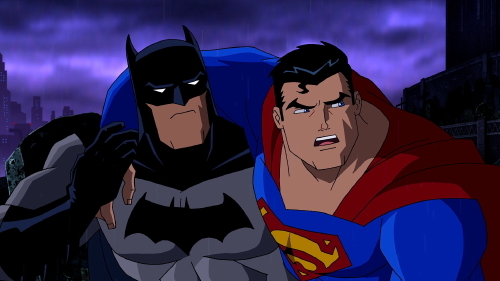 QUESTION: What were your impressions of the script for Superman/Batman: Public Enemies? JOHN C. MCGINLEY: The fun part for me showing up on any set is the preparation. A lot of times, when you are doing a play or a film, things are going to go wrong. You’re going to lose the light or the sound is going to stop working. Even in a controlled environment like that booth, which lends itself to things going right and to things flourishing, there are sometimes things that can go wrong and thus, compromises will need to be made. So it behooves the actor to come loaded for bear. If you are 100 percent ready and we have to make 40 percent compromises, then unless you have that other 60 percent ready, it is going to kind of just go flat instead of elevating it. My favorite thing, which may sound a little presumptuous, is to try to elevate the material. QUESTION: Did you enter the world of superheroes through comic books or otherwise? JOHN C. MCGINLEY: My earliest memories of Batman are watching the live-action series with Batman and Robin. That was the coolest Batmobile, and you had Frank Gorshin as the Riddler and Caesar Romero being the Joker. As far as Superman goes, it was more about the Christopher Reeve films. I was not a comic book reader. When we played as kids, we were always acting out stuff we saw Batman doing or the Green Hornet or Aquaman. But that inspiration came from Saturday morning cartoons and not proper comic books. QUESTION: As a non-comics reader, does voicing a comic character still lend itself to some child-like thrill for you? JOHN C. MCGINLEY: Well, of course, it is big fat privilege to work with these characters — and it is really fun now with Hi-Def. It just kind of jumps off the screen, and the transfers (to Hi-Def) are so beautiful now and perfect. It’s completely thrilling because the state of the art has exceeded anybody’s wildest expectations. It is astonishing. It is not as fun to see my voice come out of a character as it is really rewarding. To be a tiny component in the evolution of animation as the voice of a character is thrilling. My son is old enough to hear and recognize my voice coming out of the characters, but it doesn’t resonate with him yet. My daughter will, and that is pretty cool. Not necessarily to be a killer robot, but we will see how things evolve. QUESTION: Actors tend to be very self-critical. Is it easier to watch an animated film with your voice coming out of a character than it is to watch yourself on-screen in live-action productions? JOHN C. MCGINLEY: If I have a script early enough, I have a room set aside in our house as a rehearsal space. I set up a camera and I rehearse in front of the camera, especially for Dr. Cox on Scrubs, who has these long two-page, single-space rants. So it is almost like somebody practicing foul shots. It sounds simple — go to the free throw line and shoot a foul shot. But Larry Bird shot a million foul shots in French Lick before he ever tried for Indiana State or the Boston Celtics. So I feel like if you have text early enough, it really is in the actor’s best interests to go just hash about in front of a lens. One thing the lens does is it exposes bad habits. Like an X-ray machine taking a picture of a fracture. We all have nervous ticks, things we do when you can’t remember a line. But if you watch yourself, you can see for yourself — the camera exposes those liabilities like an X-ray machine. So yes, I watch myself on film as much as possible because the learning curve just objectively is through the roof. QUESTION: You’ve worked with some impressive live-action directors. What’s it like working with Andrea Romano in the animated realm? JOHN C. MCGINLEY: Andrea Romano is not dissimilar to Oliver Stone in a lot of ways, in as much as they’re both like a thoroughbred at the Kentucky Derby. They both put on creative blinders like a thoroughbred. Oliver and Andrea both put on blinders and invite you into that narrow creative vision which is the perfect division for the piece. So that you don’t have to do anything, you don’t have to guess. Come right inside here and it is going to be good. When you come in there with Oliver Stone or with Andrea, it is Nirvana. You will now shine. QUESTION: We’ve heard the expression, but can you define a John C. McGinley “type”? JOHN C. MCGINLEY: The John C. McGinley type usually is one of about seven different things. It is a niche that I fell into, not of my own doing, but it became the part in the films where either you are the best friend, the co-worker, the bad guy, the brother who dies and compels the hero into action in the third act, the boss, now the father of the kids, the head of the hospital usually in a position of authority. For a long time there was a group of us — Ving Rhames, me, and about a half a dozen other guys — who would be the component in the story. Who would reiterate the who, what, where, when, and how a couple times throughout the movie. You need somebody who can speak the speech without getting in the way of the speech. The hero is not going to do that. So every once in a while throughout the progression of a story, we need to be reminded where the bomb is, when it is going to go off, and who the bad guys are. So that the hero can do his job. That “type” has paid the bills for a long time.